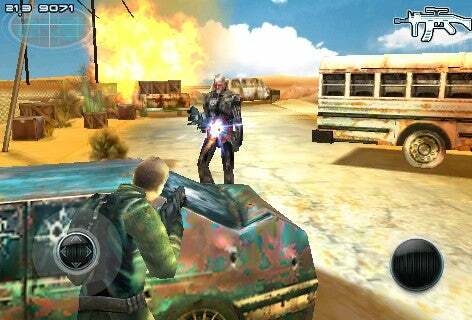 Due out the first week in May, Terminator Salvation brings the apocalyptic science fiction series to the iPhone. Tying in with the movie released later in the month, Terminator Salvation promises intense third-person shooter action set in the epic war for humanity’s survival. Fans of the series can look forward to playing as John Connor, the human resistance leader and future savior of mankind. Also playable is the mysterious character “Marcus,” whose allegiance to the human alliance is shrouded in mystery. Through over three hours of gameplay in the initial campaign and eight levels, players can guide these two characters through a post-apocalyptic war torn world. Each mission opens with a cut scene and a mission briefing that detail the enemies you’ll be encountering and their weaknesses. These enemies include the iconic T-800 Model 101 Terminators and other robotic enemies designed by Skynet— including tanks, motorcycles, and spider-like attack drones. But don’t worry, you’ll have plenty of armament to fight the robotic armies of Skynet. During the demo, I put down a variety of T-800 Models with my assault rifle and annihilated several tanks with my anti-tank gun perched from the back of my all-terrain vehicle. Other weapons, including shotguns, grenade launchers, chainguns, and something called the “surge cannon” are also available through the course of the game. Click thumbnail for a larger image. During the Machine War stage, I guided John Connor through a bombed out desert city. With my right hand, I could fire my character’s gun, and with the left I could move using the iPhone’s touchscreen. There are a couple modes of control that can be set to your liking. Initially I could move with the use of my left thumb and could align the camera a scale on my right. Finding this clumsy for firing, I switched to a mode that let me move with the left side and aim with the crosshair itself. After a couple minutes, I had the hang of it and guided Connor through a course with Model 101s and fellow human resistance fighters. The graphics were pretty spiffy for the iPhone, and the amount of detail Gameloft has paid to things like cutscenes is impressive. Helicopters glide over the landscape, burned-out cars scatter the landscape, and your allies realistically duck for cover when in combat. The story, though it lacks voice acting, is engrossing and seems to speak to a longer development time than a simple movie tie-in. Later, I guided Marcus through a decimated road on the back of a modified pick-up truck that reminded me of the Warthog from Halo. 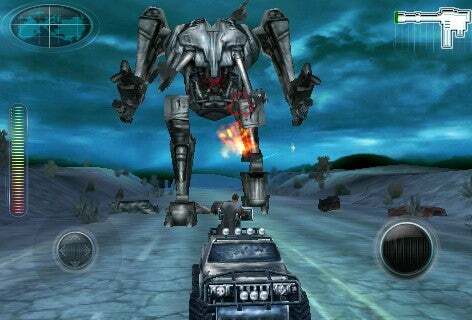 But unlike that iconic shooter, you guide both the vehicle and the back turret in Terminator Salvation. It proved more challenging than I thought as aiming the gun would also cause the truck to move in that direction. I constantly was flying into the sides while enemy tanks took pot shots at me. Thankfully, the game was set to a forgiving difficulty level, as I didn’t die despite possessing the driving skills of a pimple-faced sixteen year old steering a zamboni. While fun (and challenging) to complete this level, only until I faced “The Harvester” boss at the end of the level did I really feel at home. Control of the truck was thankfully given to the allied AI, leaving you to shoot at the approaching walking death robot’s weak points. As you work your way through the game’s story, you’ll encounter microchips dropped by defeated enemies. These unlock content for the game, increasing the replayability and depth of the game. Gameloft plans on pricing the game on the premium end of the spectrum, likely $8 or above, and the visuals speak to the game’s high budget. Still, we’re not paying for an animated trailer, so hopefully the gameplay is deserving of the price and the Terminator name. 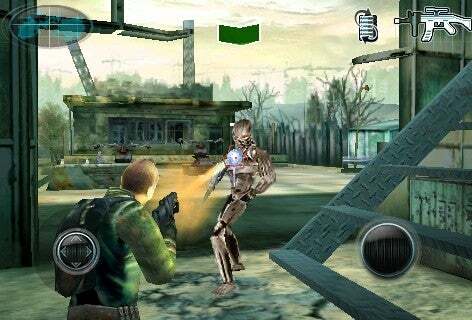 Few games have been able to integrate action/combat controls intuitively with the iPhone’s unique motion sensor and touch screen capabilities. Terminator Salvation is a title to watch because it’s attempting to balance an already gripping story with stunning graphics and a third-person shooter interface. Whether it’s destined for termination or salvation remains to be seen.